With the worst possible calendar configuration for Halloween, the studios deliver very little in the way of scares this weekend. Instead,our new releases are a couple of thrillers that will hope to capture a slightly older audience that isn't partying as much. The most promising of the two new films is Nightcrawler, directed by Dan Gilroy and starring Jake Gyllenhaal as an amoral freelance news camera man, hustling around the streets of Los Angeles at night for footage of crime scenes to sell to news stations with slightly looser ethical standards. The closer to them happening the better, and even better is as it happens. Gyllenhaal, cutting a gaunt, creepily-unblinking figure for this film, decides that when business is thin, it might help to drum up some business independently by creating some gore of his own. 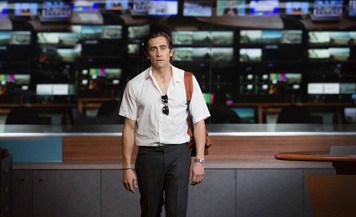 Playing just this side of satire, like Network, Nightcrawler aims to be a thriller exposing the seedier side of TV news production, which isn't exactly the kind of thing that screams blockbuster. However, the film's take on the material, with a gritty, you-are-there (irony alert!) style and a chilling, widely hailed performance from Gyllenhaal that borders on sociopathy could bring in a wide audience on a quality basis. Reviews, in fact, have been tremendous, and Gyllenhaal has been stealthily building a reputation as a small box office draw over the past few years.